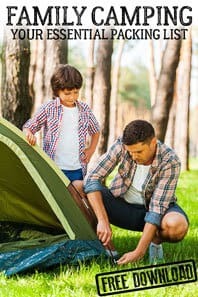 One of the key number concepts that children need to grasp early on is number bonds. Number bonds make addition and subtraction much easier if these are learnt. 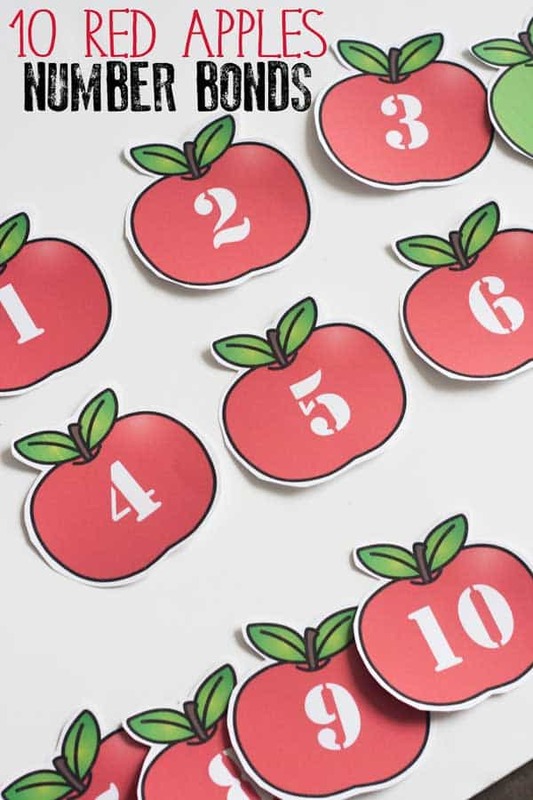 Hands-on activities are a great way to do that and this activity based on the book 10 Red Apples is a fun apple themed maths activity for preschoolers and above. Scroll to the bottom for more apple themed learning activities for 2 to 5-year-olds. Number bonds are the relationship between two numbers to form another number. 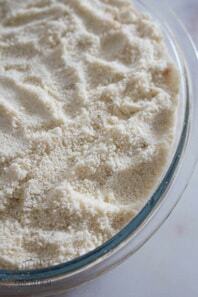 It makes subtraction and addition easier once children learn the relationship. 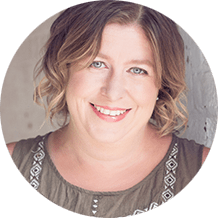 With preschoolers and those entering school, we talk about number bonds to 5 and then number bonds to 10. 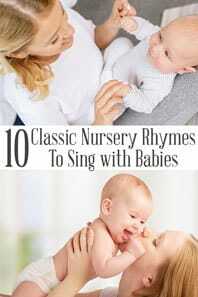 This is because 5 and 10 are easier numbers to count in and after children learn to skip count (count in 2’s), 10’s and 5’s are the next numbers. As they progress the number bonds learnt in the early years help with the addition of 2, 3 and more digit numbers as well as subtraction of more complex numbers and also in estimations. 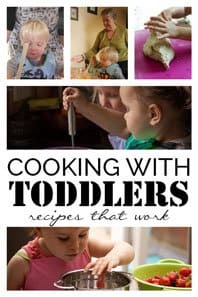 We have provided affiliate links to Amazon to help with your shopping of resources for an apple themed preschool unit. With this week’s book for The Virtual Book Club for Kids being 10 Red Apples, working on number bonds to 10 is ideal. 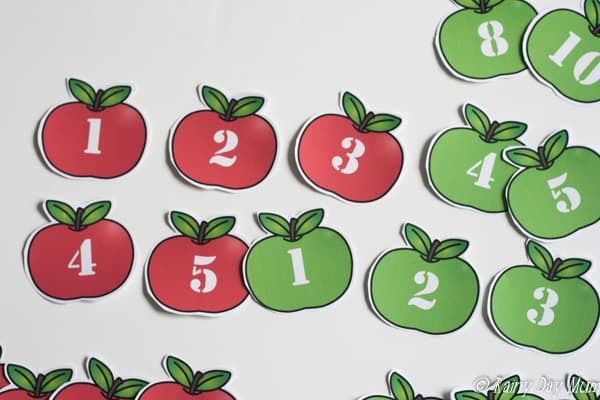 Join our weekly Toddler and Preschooler Activity Newsletter and get these 10 green and 10 red apples for number games FREE plus more! 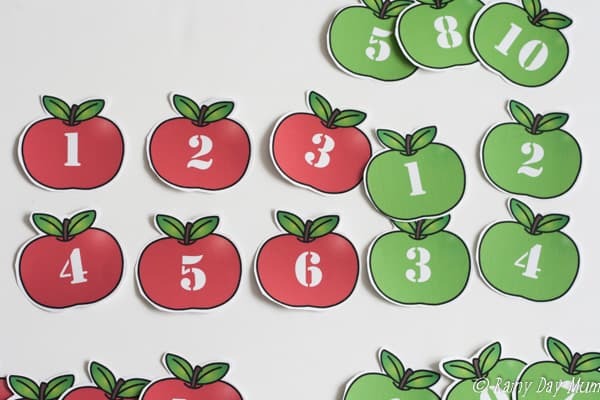 We have this Sorting Pie from Learning Resources which comes with red and green apples but not to 10 so would be good for younger children working on the first set of numbers bonds to 5. 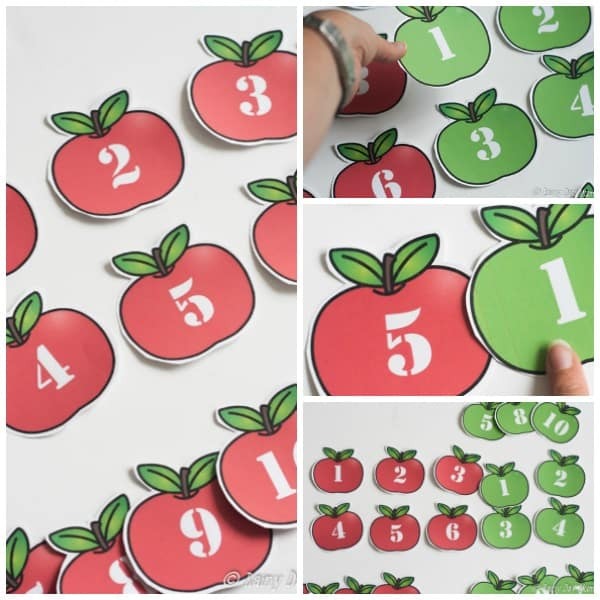 Working on Number bonds to 10 using some Fake Apples for Flower arranging – 15 red apples and 15 green apples you can work on number bonds to 10. 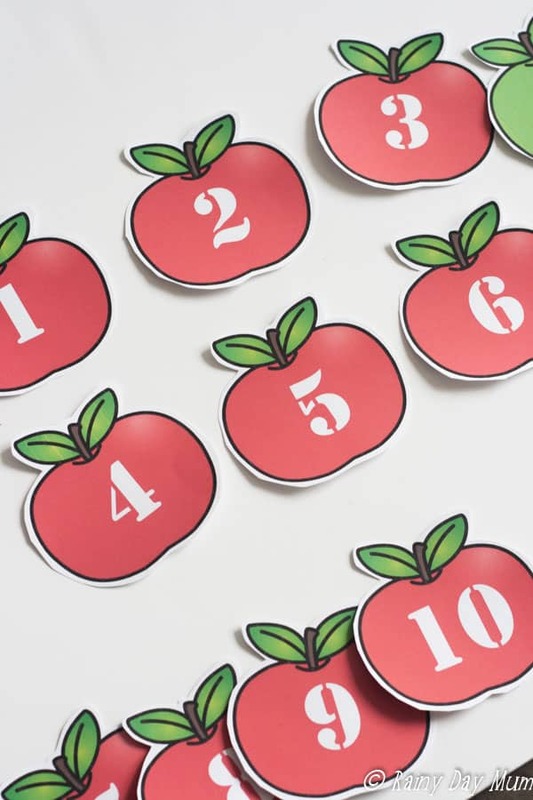 If you have downloaded our Number Bonds print out – cut out the apples and lay the red apples in order 1 – 5 and 6 – 10 below. Ask your child to count and point to the numbers on the apples as you go along. Now remove numbers i.e. 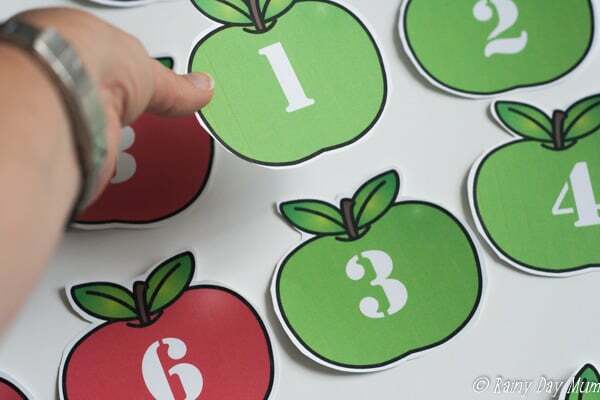 10, 9, 8 and 7 and ask your child to fill in the spaces with the green apples to make 10. 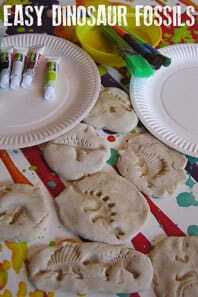 Check out our 2-ingredient apple scented play dough recipe which you could use to make your own apple counters with. 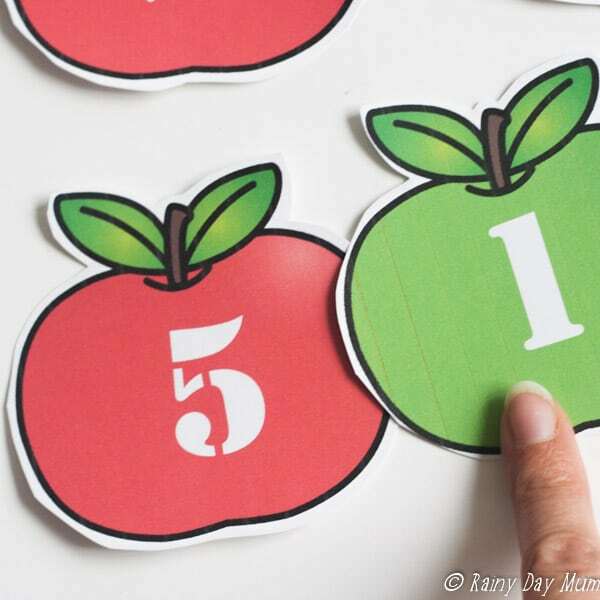 Lay them in order counting out the numbers and pointing to the numeral on the apple at the same time. This will help to reinforce number recognition as well. 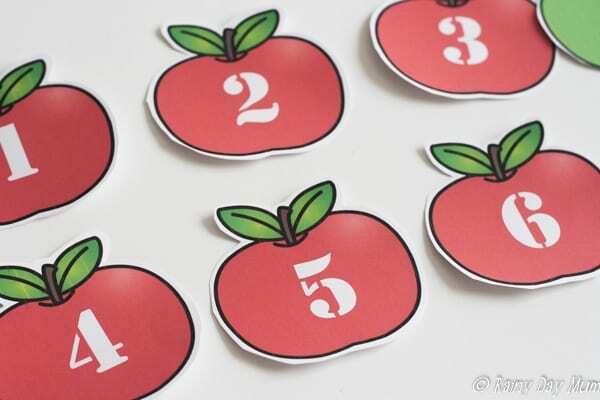 Now count the red apples – then the green apples and form a number sentence i.e. “5 red apples and 5 green apples make 10 apples”. Repeat with other combinations of the number bonds so that children start to learn the relationship, make sure that you do the reverse of number bonds as well e.g. 6 red apples and 4 green apples and also 4 red apples and 6 green apples. 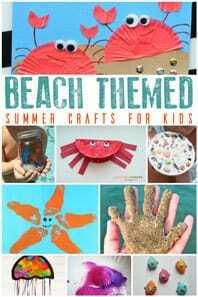 Based on the book 10 Red Apples by Pat Hutchins The Virtual Book Club Team have produced these hands-on activities for the different areas of learning. Don’t forget that you can come and join us in The Virtual Book Club for Kids Facebook Group for more themed book based activities and ideas.